"Downton Abbey" creator Julian Fellowes is staying with the topic of great estates in "Belgravia." 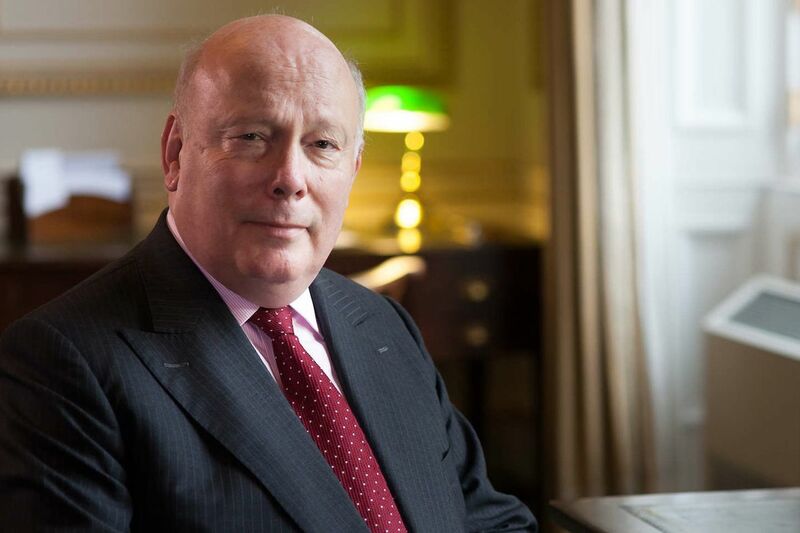 When last we met Julian Fellowes, it was at Downton Abbey, where modernity was creeping into the Crawleys' way of life. Fellowes was creator, writer, and producer of TV's beloved costume drama, whose finale in March coincided in the story with the demise of the landed gentry. But great estates are a prized topic for Fellowes, an actor, writer, and member of the House of Lords. He has also written novels, movies such as The Young Victoria and the Oscar-winning Gosford Park, and the Broadway musicals Mary Poppins and (more surprisingly) School of Rock. This time, Fellowes visits the Regency and Victorian eras. Belgravia, a novel, follows two families who meet at the Duchess of Richmond's (real) ball in 1815 Brussels on the eve of the Battle of Waterloo. Their lives are tied together from that moment, as the story jumps ahead to the 1840s and one of the poshest of London neighborhoods. It's most precise to say Belgravia is going to be a novel - first, it's being released via another medium. Fellowes is telling his story week by week in a podcast - Serial-style - in 10 installments. You can read the first episode, released April 14, free at www.julianfellowesbelgravia.com. Then, if you're hooked, you can pay for successive episodes one by one or in a bundle. Belgravia will be published in book form in July. The format may seem relatively new for fiction, but it does resonate with the 19th-century setting of the novel. That was when serialized novels were the craze, a practice often associated with Charles Dickens and novels such as his Pickwick Papers. "Many of the great novelists of the 19th century were first published as serials in magazines, so sometimes you can see the effects upon the story," said Helen Zaltzman, a Londoner who has two popular podcasts, Answer Me This, which responds to all manner of listener questions, and The Allusionist, which delves into the history of language. "If sales started to dip, writers would have to scramble to come up with something irresistible to readers, like a sudden death or other dramatic catastrophe." Belgravia "sounds to me like a wonderful idea, the 19th-century serialized novel updated for the 21st century," said Paula Marantz Cohen, professor of English at Drexel University and author of several novels that are modern stories based on the classics. "We've just begun to offer a series of one-credit great books courses in the Honors College, where I am dean," Cohen says. "Students can read a book in a leisurely fashion: one book over 10 weeks, meeting one hour a week, for one credit. These are enormously successful. The podcast format would, I think, add another element of ease to the experience." Cohen also cites TV shows such as House of Cards "using this technique to tell compelling, complex narratives that develop characters who change over time. This format is why we are in a new golden age of television." The serialized podcast novel is fairly well established: It has been around at least 11 years. "I love that Mr. Fellowes references the serial work of Dickens" on his website, said Scott Sigler of San Diego, a best-selling author of 15 books and six novellas. Sigler launched his writing career through serialized podcasts. "The Independent called me the 'Digital Dickens' way back in 2008," he said. Sigler, Mark Jeffrey, and Tee Morris, now all commercially successful authors, launched serialized novel podcasts on the same day in 2005 at the encouragement of Evo Terra, who ran a sci-fi and fantasy site called the Dragon Page. By giving their podcasts away, the three built their own audiences and brands. "We saw it as a way to get noticed," Jeffrey said, "to get above the noise. We were all in that catch-22 of no agent, no publisher. How do you get an agent? Nobody wanted to rep us until we somehow had proven ourselves. Podcasting gave a free microphone to the world." All three wound up with book deals. "I got my deal partly because [actress] Abigail Breslin had listened to my Max Quick podcasts," said Jeffrey, who lives in Santa Monica, Calif., "and mentioned in an interview that they were some of her favorite books." Even though he's commercially successful, Sigler hasn't forgotten where he came from. He still gives his novels away in podcast form, averaging 630,000 individual downloads per month. Sigler and Jeffrey welcome this famous newcomer on the scene. "I think it's great that Fellowes is serializing an audiobook," Jeffrey said. "It is good for the genre. Anyone can create a podcast and be listed and get an audience. Julian is opening the door for new voices by validating the space. He is creating opportunity for new authors in his wake."